I took one day to venture into Sarasota FL to the Sarasota Jungle Gardens and the Marie Selby Botanical Gardens. 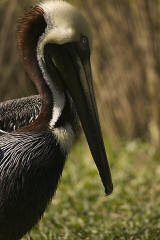 The Sarasota Jungle Gardens is a ten acre zoological park in the middle of Sarasota. The gardens were designed and planted in the early 30's when the owner of the property planted thousands of exotic trees, shrubs and flowers. The write-up on the gardens are not clear about how the present ownership came about, but in the early 1970's birds and other animals were introduced into the gardens. Over 80% of the birds and animals were rescued from adverse conditions or were donated by people unable or unwilling to continue caring for their exotic "pets." Today, in addition to the rescue and rehabilitation efforts, the gardens has an active Greater Flamingo breeding program. See www.sarasotajunglegardens.com for more. This was well worth the $11 entry fee. 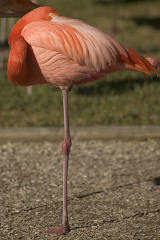 One of the many Greater Flamingos (Phoenicopterus ruber) in the flock at the gardens. 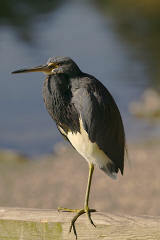 A Tri-colored Heron (Egretta tricolor). Since the gardens are open, many local species of birds decide to make the gardens a home too. It's hard to tell whether this Brown Pelican (Pelecanus erythrorhynchos) belongs to the gardens or whether it's a local looking for an easy handout. 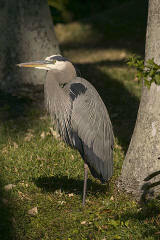 An adult Great Blue Heron (Ardea herodius). Again, this could be one of the local birds. 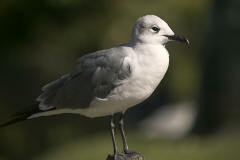 A common Herring Gull (Larus argentatus). Certainly one of the local birds. 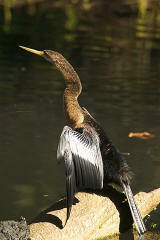 This is an Anhinga (Anhinga anhinga). This bird is often mistaken for a cormorant, but is in a completely different family. More . . .